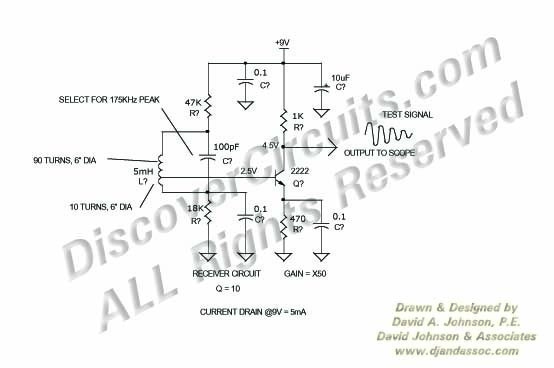 Circuit: 175KHz INDUCTIVE PULSE RECEIVER __ Circuit designed by David A. Johnson, P.E. This circuit is discussed in more detail in the Experimenters Journal. The receiver’s six inch diameter coil detects the ring signal from the above transmitter and use a single NPN transistor to provided enough Amplification for the signal to be easily viewed on an oscilloscope.